We’ve been working on this updated version of the original Eastside Blazer for almost a year now. And have the final proto under our feet with complete joy and satisfaction! We kept most of the great qualities of the original version and just changed a few things from valued fan feedback . If you have the original version and are ready for a new one, then don’t fear this one has the same awesome feel with just a few minor changes. We think you’ll love it as we do and will barely notice the difference unless you are a longboarding geek like we are! 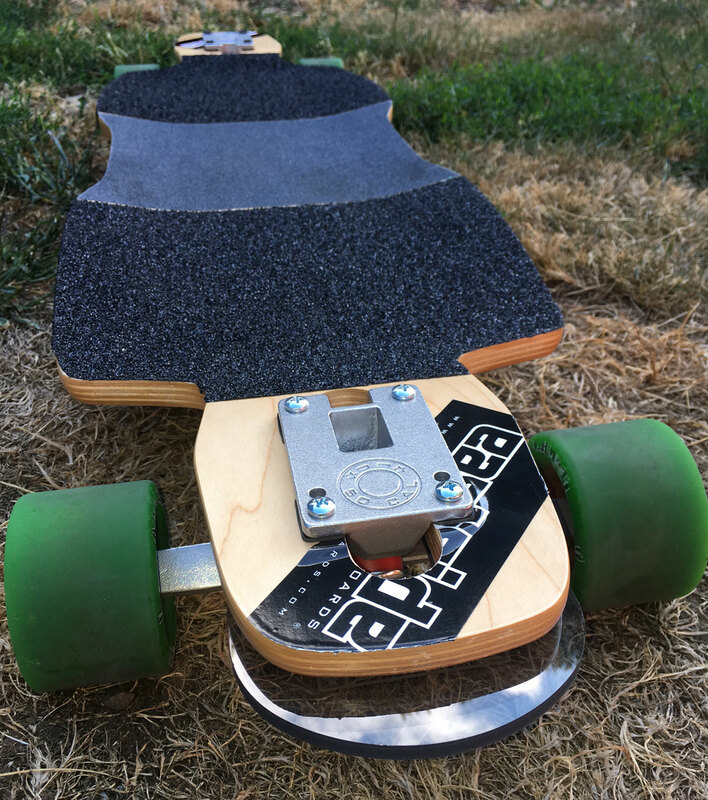 Blazer V2 Drop-Through model with Caliber 50 degree trucks and 76mm Abec 11 Flywheels. We added a bit more wheel-clearance as some riders who ran stock bushings and really big wheels over 76mm would occasionally get wheelbite if they were a heavier rider. So we made sure you can run center set 80mm wheels like the Orangatang Kegels with soft bushings and loose trucks without getting wheelbite. We also added a bit more meat on the ends of the board for durability making the overal length 40″ instead of the previous 39.5″ inch. 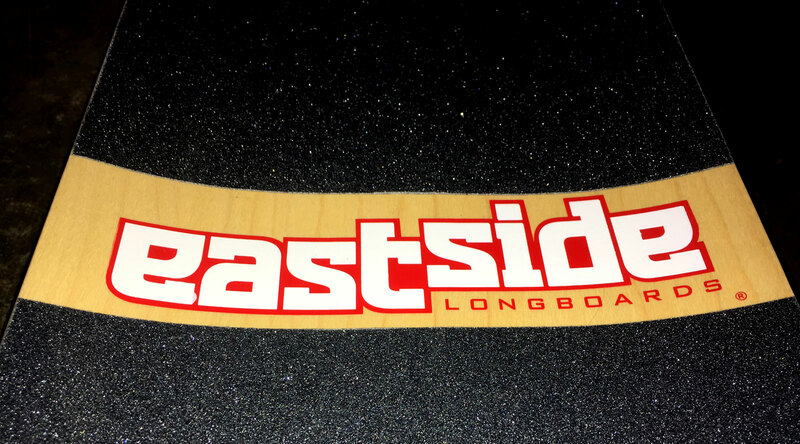 However we still recommend the Nosejob Noseguard for this board, which still fits great on it and ensures no damage when it slams into a curb. Blazer V2 Drop-Through with Nosejob Noseguard showing complete coverage and protection. The Nosejob is designed to slide back upon a hard impact to the end. 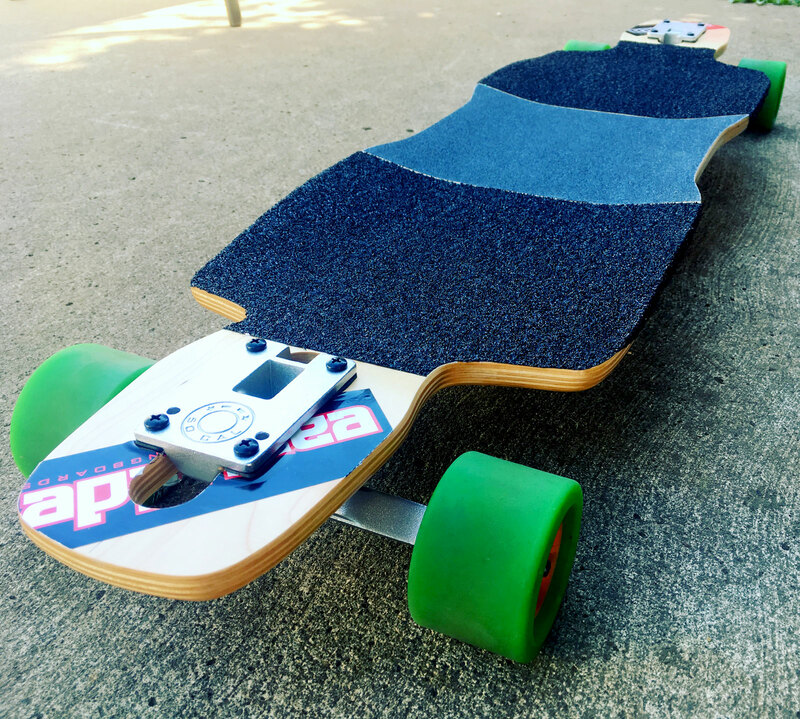 The riding platform of the board is still longer than most other drop-through boards with an EFP of 26″ allowing a wider stance for taller and heavier riders. It is deemed the larger rider’s board or for those riders who prefer a wider stance with plenty of room to spread their feet out. It’s also made from 9 plies of 1/16″ longboard grade maple to hold up to 250 pounds without much flex at all. So yes you taller and heavier riders will love the ample room you have on this double drop board! Top view of the Blazer V2. 3/4 view of the Blazer V2. Another change was adding a bit more concave with no angled edges or gas-pedals. After riding each version down hills and sliding both hands down and stand-up, it became clear that the higher concave on the new version feels more locked in than the original version which had gas-pedals. Blazer V2 Drop-Through concave shot. One last change was adding a top print silk screen logo in the center of the board just like the lastest version of the Relic board has. We are keeping the original Blazer bottom graphic of molten fire and lava capturing the essence of the Blazer. Eastside logo printed on top of the board in center. Here’s all the official specs of the new version below. Expect to see the Blazer V2 available during the next month on our website here and at our official online retailers Daddies Board Shop and MuirSkate.com. Like the original version it will be available in both Drop-Through and Top-Mount, both having the 5/8″ drop-down platform.